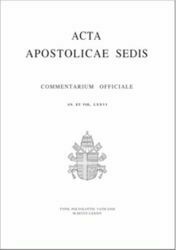 Subscriptions, back issues and supplements of Acta Apostolicae Sedis (Commentarium Officiale. Semel prodeunt in mense) (Acts of the Apostolic See), the official gazette by the Holy See and the Vatican City. Released monthly in Latin, it contains decrees, encyclical letters, decisions of Roman congregations, and notices of ecclesiastical appointments. 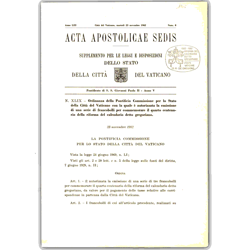 Since 1929, Acta Apostolicae Sedis carries a supplement in Italian, called Supplemento per le leggi e disposizioni dello Stato della Città del Vaticano, containing laws and regulations of the Vatican City.